"Lucien Durosoir (1878-1955) began his musical life as a concert violinist but his career was interrupted - and indeed ruined - by the First World War, during which he spent a considerable period as a soldier (under stress) with André Caplet, who encouraged him on his return to the civilian life to turn to composition. This recording offers his limited but remarkable output for his own instrument, for which he writes hauntingly and with total freedom. Indeed, although these works partner piano and violin perfectly, one often feels that in the melodic interplay each instrument seems to move independently. The memorable two-movement Sonata opens with pensive melancholy but is soon energetically inventive in its abundance of ideas, quixotic in its harmonic shifts and rhythmic impulses. The second movement doesn't greatly change momentum or style. Oisillon bleu trills in a semi-delirium of ear-tickling unpredictability, while Rêve is meditative. The Nocturne is more troubled in feeling than one would expect from its title, but calm at the close. 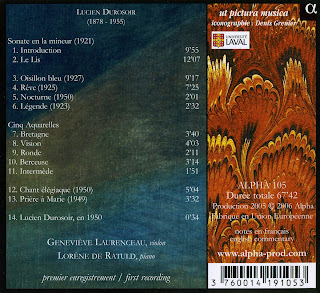 The early Légende is a brief reverie born over a rising scale, but has a short, more turbulent middle section, and the other miniatures, the rapturous Chant élégiaque and the lovely, gentle Prière à Marie are a late works full of exquisite tenderness. Then the delightfully varied Cinq Aquarelles have such instant appeal that they should find their way into the main repertoire. The performances are very persuasive. 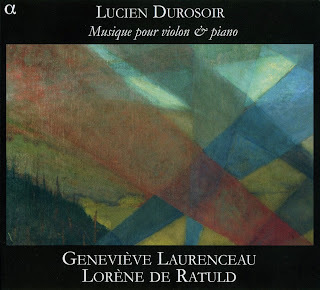 Geneviève Laurenceau, often playing with great delicacy, creates a lovely timbre, subtly coloured, and Lorène de Ratuld is a wholly sympathic partner. They are beautiful recorded and the balance is remarkably well managed. The recitals ends with a brief comment (in French) from the composer. A disc well worth exploring." Thanks a lot for posting this CD of a wonderful and forgotten composer ! Apparently, the 3rd part is corrupted. Could you repost it on Mediafire please ? I've tried reposting, but Mediafire files still are corrupt. So I've removed the Mediafire link - Mediafire causes lots of problems like that. The Rapidshare files should be interchangeable with the Mediafire ones though. Thanks for reporting! Yes Edmond, unfortunately many mediafire links are corrupt lately. Dank je wel voor deze muziek van deze voor mij onbekende componist. Many thanks for this music by a composer completely unknown to me. spy watchpokerturneringar It should be such that the recipient should always cherish these moments for a long period of time.